We own a selection of other caravans, all available for hire on Golden Gate - please see Ref: 6959, 1835, 1669, 2465, 2617, 3145, 3151, 1692, 451, 2964, 451 and 1551on this website for further details. Check-in from 1.30pm check-out by 10.30am. Thank you for enquiring about our Plaza Grande, please fill in the requested information. PLEASE NOTE - Only a max of 2 small, none moulting/shedding dogs allowed. Our beautiful Plaza Grande is furnished to our usual very high standards throughout. It has a large fully enclosed decking at the front with luxury rattan furniture. There is a ramp at the side for the convenience of those that find steps a struggle. The lounge has a large free standing 3pc suite, wall mounted tv with freeview, Sky HD connection (you just need to connect your own Skybox). The kitchen is incredibly spacious and well equipped, it has the added bonus of having a washer/dryer and large American fridge/freezer with water and ice dispenser. 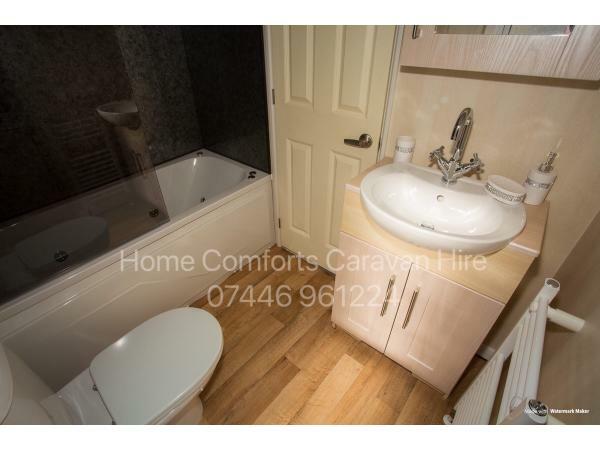 The spacious family bathroom has a full size luxury jacuzzi bath with shower above, wash basin, toilet plus, heated towel rail, plus plenty of storage. The large master bedroom has a king size bed, plenty of storage, walk-in wardrobe, wall mounted tv, plus an en-suite bathroom with shower, toilet & washbasin. The twin bedroom has 2 single beds, lots of storage and tv. All beds have quilted mattress and pillow protectors fitted, all duvets & pillows are provided. Bed linen is not included in with the hire price but can be provided for a small fee. The Plaza Grande sleeps 4 people. Check-in is from 1.30pm, check-out by 10.30am. DOGS - Due to the high demand for our dog friendly vans we have decided to allow SMALL, NONE MOULTING/SHEDDING dogs to stay in this caravan. We have a dog ourselves and know the pleasure of taking a dog on holiday, so we welcome SMALL well behaved dogs. We understand that you can’t take your dog everywhere with you (shopping etc) so we don’t mind you leaving them for short periods but please don’t leave them for long periods as a bored dog can become a destructive dog plus caravans can become very hot in the warm weather. I stayed in this caravan for 4 nights Monday to Friday last week with my 8 year old daughter and cockapoo, and what a beautiful caravan it was, definately home from home. It has all the modern amenities you could wish for; there isn't anything Mandy the owner hasn't thought of, you can literally turn up and start enjoying your break straight away. 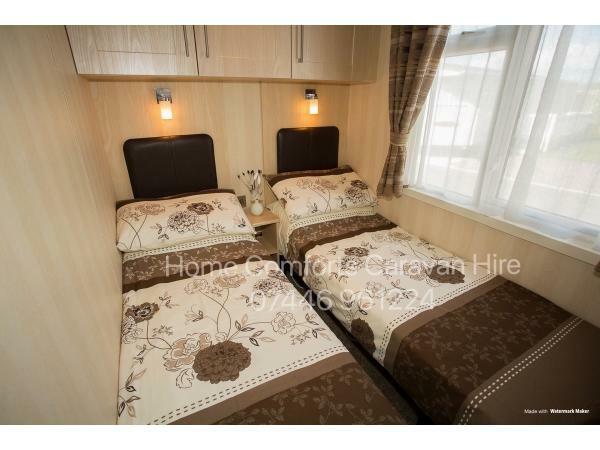 Placed in a quiet location on the caravan park, a short walk from the beach and central for easy acess to places such as Rhyl, Conway and Llandudno for days out, we truely loved it and didn't want to leave. The booking process was quick and straight forward and Mandy and her husband were close by if we needed anything. I would definately recommend.